Probably some of you have seen this from my husband’s FB page or from my twitter page 😉 Bella’s underwater picture.. No she is not yet swimming but she’s able to hold her breath and open her eyes underwater. She seem very comfortable and enjoying it 🙂 We are still waiting for more pictures from her swimming instructor but bear with this one for now..
Posted on April 14, 2012 by Dr Halina Mohd YunosPosted in Development, MommyhoodTagged swimming. Previous Previous post: Green vege for B! Next Next post: Beef Casserole and Butternut Squash for Little B!! Dr Halina where did u get her wetsuit? Eeeeeeeee… Cute nyeeeer, rasa macam nak gigit!! ya allah terror ! !akak pun tak pandai berenang !! wow! !so amazinggg..B are strong girlll….. dR ajar mcm mner nih??? 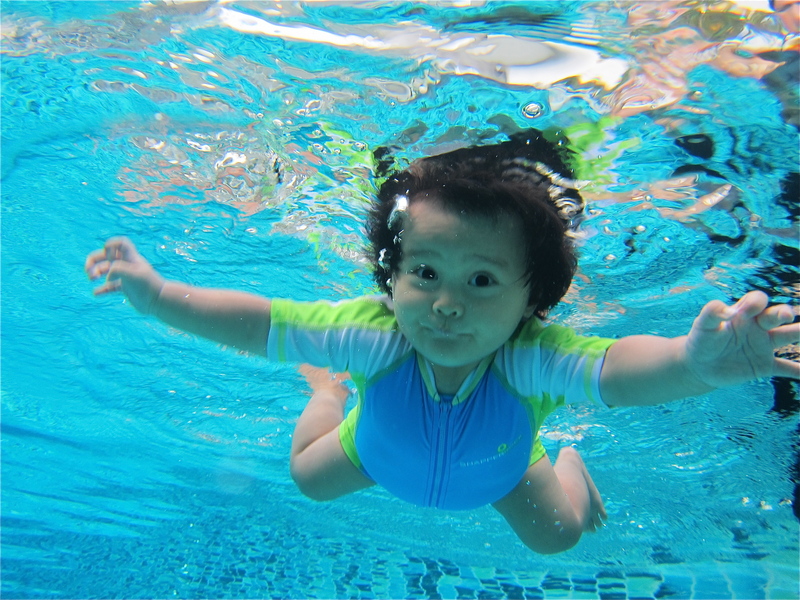 mahal tak fees utk class berenang utk baby ni? Great job!! Too cute of a pic! Kak Na, nak nangis tengok Bella! Bella pandai! Xsabar nak tunggu dia besar. Love Bella! If u don’t mind sharing, can i get the private instructor contact details. Plan to hire one for my son as well. bella tak pedih mata ke kena air klorin? she is so cute.. nampak matured in the water.. mcm 2 years old lil gal..
Hihi, i’m keen to know where to find instructor to coach the little one. Mind to adv?